the wiles of march flipped up their tails and stomped on outta here, theo. all this knee-deepness and oh-poor-me doesn't work when you show pictures of yer bloodline. you be a lucky man, yo. 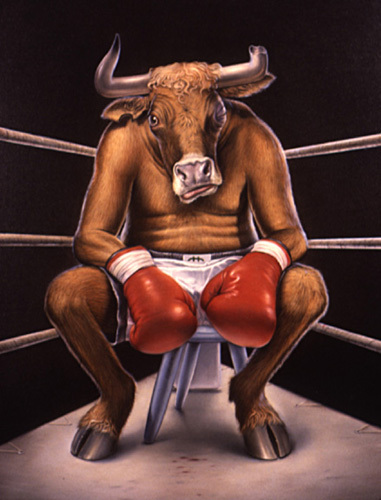 to cheer you up i thought i'd hand over a pic taken of bulldust after he went up against La Punta del la Runt, a spanish boxer i myself once went up against back in '02. if i recall this was taken right before the seventh round, when the bull got sucker punched in the kidney and went down like a sack of kiwis.